Long after the “damn” controversy of 1939, we’re still struggling with how to regulate the public use of profanity. Managing expectations about swearing and profanity in the workplace can be particularly contentious: There have been several workplace lawsuits brought by employees who lost their %&#*-ing jobs because of profane language at work (one major lawsuit involved two Hooters waitresses getting into a profanity-laced argument in front of customers). But why do we consider the use of profanity to be such a taboo act that we’re willing to hand out fines and ban it from the workplace altogether? 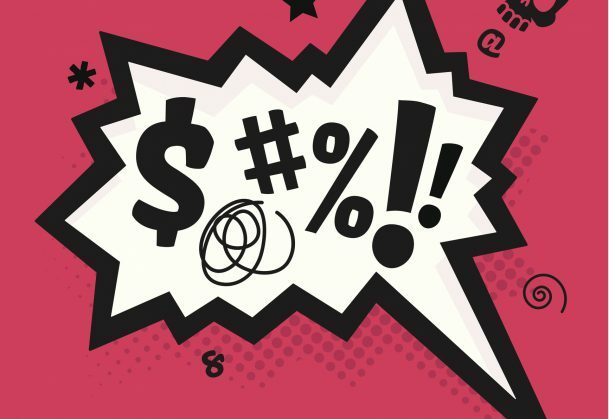 A new study conducted by an international team of researchers from the Netherlands, the United Kingdom, the United States, and Hong Kong has found evidence that a little swearing may not be so bad for business after all. While we might associate profanity with negative character traits, like dishonesty or aggression, lead author Gilad Feldman (Maastricht University) and colleagues found that, in reality, people who swear like sailors may actually be more honest. In their first study, the researchers recruited 276 participants to complete a survey on their profanity usage. Participants were asked to list their favorite swear words and the profane words they used the most often. Participants also self-reported the frequency that they swore under different circumstances: in person (face to face), in private (no one else around), and in writing. Honesty was measured with a commonly used personality scale that required people to fess up to a series of yes or no questions, such as whether they always keep their promises no matter what and whether all of their personal habits are positive, good ones. In a second study, the research team turned to Facebook for a large naturalistic sample of public swearing. To detect dishonesty, the researchers ran Facebook status updates collected from 73,789 profiles through a linguistic analysis program called Linguistic Inquiry and Word Count (LIWC) looking for linguistic tip-offs signaling dishonesty. Previous research has found that liars tend to rely on certain words more than others. For example, liars tend to use fewer first-person pronouns (e.g., I, me) and more negative words (e.g., worried, fearful). Again, there was a positive link between swearing and honesty. By analyzing Facebook profiles from American participants, the researchers were able to calculate state-level rates of profanity use. Integrity and corruption levels for each state were obtained through the State Integrity Investigation 2012, an analysis conducted by the Center for Public Integrity, Global Integrity, and Public Radio International. States whose residents were more freewheeling about swearing actually had lower rates of corruption on average. Two of the three states with the highest profanity rates, Connecticut and New Jersey, were also two of the three states with the highest integrity scores on the index. Georgia and South Dakota, on the other hand, had the worst corruption ratings and comparatively low levels of profanity use.